Bāri parāiai / Surajīta Siṅgha Kālaṛā. Dillī : Naishanala Buka Shāpa, 1979. From the University of Chicago Library. 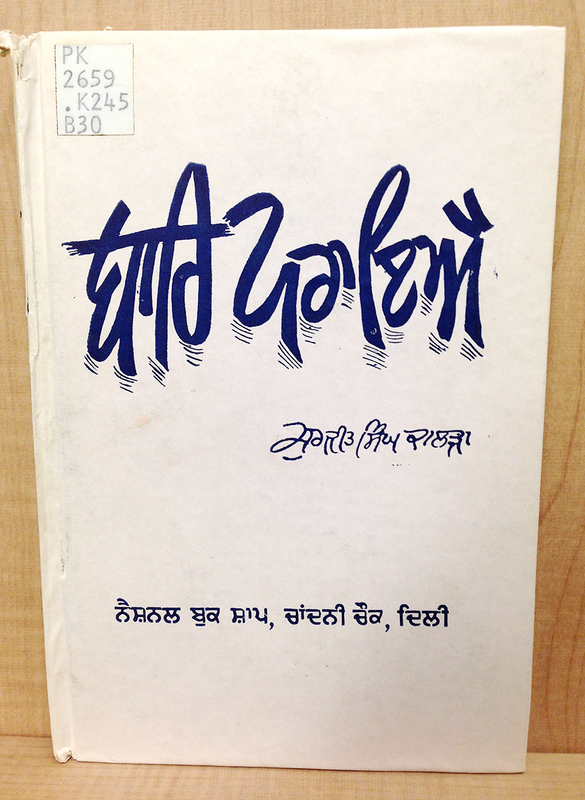 ਬਾਰਿ ਪਰਾਇਐ Bari Paraiai by ਸੁਰਜੀਤ ਸਿੰਘ ਕਾਲੜਾ Surjit Singh Kalra. I believe that this is the same Surjit Singh Kalra, who unfortunately passed away recently. He was the author of numerous Punjabi language books and Punjabi language-learning materials. Bari Paraiai appears to be a book of short stories, but I’m unsure of what the title’s meaning. Some nice movement lines happening in this title lettering – I wish I knew how they relate to the content!